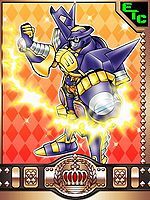 A Digimon that possesses power over Thunder which bears the might of one of the legendary Ten Warriors. Its keen movements, unbecoming of its large build, are a technique to form a high voltage current running throughout its body. It generates a special magnetic field that produces an anti-gravity state in its vicinity, and is capable of high-speed movement. Its overflowing thunder power comes out as sparks from various parts of its body, and although Blitzmon looks mechanical, its personality is, in contrast, expressive and human. Its language is trollish, but it additionally conveys excess warmth. In battle, its underwater mobility is weak due to the nature of its wrestler-like style. Its Special Moves are clasping its hands together, then dynamically swinging them down (Thor Hammer), and making lightning fall from the sky like rain (Mjölnir Thunder). Title: 「雷の人闘士」 — "Human Warrior of Thunder"
Thor's Hammer  トールハンマー Tōru Hanmā Thunder Fist/Grand Hammer Gathers lightning on its hands and hits the foe with them. 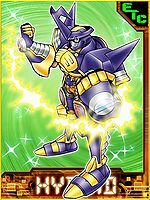 Mjölnir Thunder [N 1] ミョルニルサンダー Myoruniru Sandā Thunder Fist/Lightning Blitz Strikes the ground, sending lightning through it at the enemy. Dishes out a powerful punch with great destructive power. Uses Thor Hammer while in mid-air. 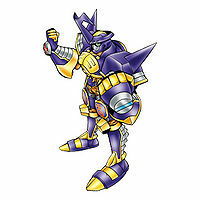 Grabs the opponent and attacks it with a continuous barrage of lightning before finishing with a headbutt. It does an uppercut that sends the opponent flying into the air. A downwards kick from the air. 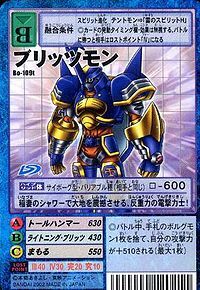 Lightning Bomber  ライトニング・ボンバー Raitoningu Bonbā Lightning Blitz/Proton Slam Gathers lightning on the horn on its head and dives towards the enemy hitting them head first. 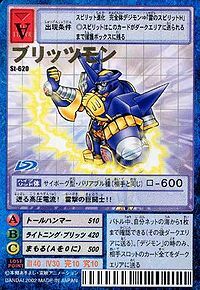 Plasma Double Tomahawk  プラズマダブルトマホーク Purazuma Daburu Tomahōku Proton Slam/Avalanche Axes/Avalanche Axes Lightning Bomber A joint attack between Blitzmon and Blizzarmon. 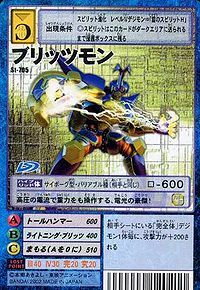 Blitzmon grabs Blizzarmon's tomahawks Eji and Oji and wraps them in electricity, attacking by riding a blizzard created by Blizzarmon. 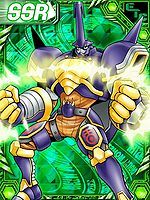 First appeared in Digimon Frontier - Episode 05. 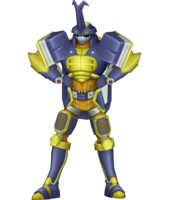 Using the Human Spirit of Thunder, Junpei Shibayama becomes Blitzmon. 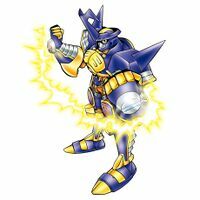 By using a Spirit of Thunder on a Wormmon or Stingmon, it will immediately evolve into Blitzmon in the next battle it enters. 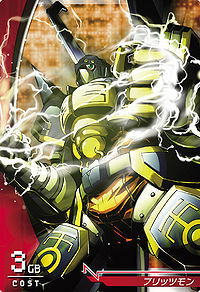 Blitzmon is a playable character in this game where it can slide evolve to Bolgmon or Ancient Beatmon. 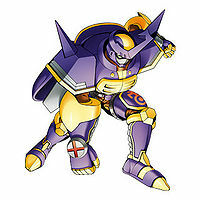 Blitzmon appears as the enemy on the Lightning Rock Dome level. Blitzmon's alternate colouration is red. 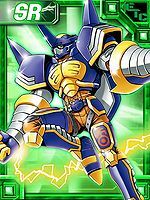 Blitzmon is available as a Digimon Medal. Surging high voltage electric current! The great warrior of thunder attacks!! Using high-pressure electric current, this hero of lightning can manipulate even gravity! It shakes the earth with a shower of lightning, an anti-gravity thunder attacking wrestler! It controls its electric shocks superbly, frying its food without burning it! An evolution achieved with the Human Spirit that holds the power of the Warrior Ten of Thunder. 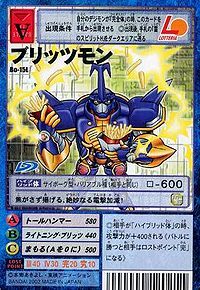 It is capable of high speed movement due to the high-pressure electric current that runs through its body, and it fights with a wrestling style while setting off sparks. 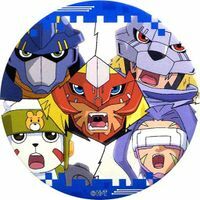 ↑ 8.0 8.1 Digimon Frontier: "Save the Burgamon! 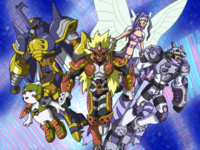 Tomoki's Pure Heart"
↑ Digimon Frontier: "Thunder Power Shaking the Ground, Blitzmon!" ↑ Mjölnir is the hammer of the Norse God of Thunder, Thor.